There’s a lot of emcees coming out of London, but this my friends is one of the better ones! 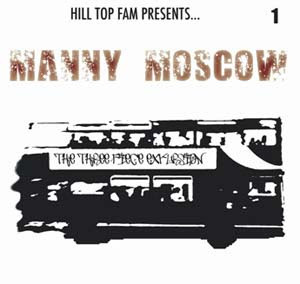 He is not rucksack Hip-Hop, he is not Grime, he is not Urban, he is just Manny Moscow and the music he makes is Hip-Hop! LOL. Yeh that’s the best way to describe him. He can get down on any tempo and his contribution towards the new "100% Exclusive" CD by UK Runnings really had me intrigued. This is a three track EP, and three tracks it is which kinda gutted me as I was looking forward to a mixtape or full-length album! Track one ‘Straight 48’ is a deep string led mystical groove produced by Mr Biils that is something really special. Next up we get a collaboration with fellow-Londoner Shepherd entitled ‘You Can’t Tempt Me’ and tucked away on track three is the EP’s biggest highlight ‘Cross Over’. I really like the vocal tone of Moscow as he takes it more gully and more road! Give us a mixtape Moscow, c’mon blud! LOL.